While researching the aurorae of the Jovian planets in our solar system (Jupiter, Saturn, Uranus and Neptune) I discovered a very interesting correlation between their magnetic fields. As the above graphic clearly shows, regardless of their angle of rotation in relation to the orbital plane of the solar system, the axis of the planets’ magnetic fields more or less remain perpendicular to the orbital plane. Earth’s and even the extremely weak magnetic field of Mercury are also aligned in this manner. Most likely this alignment is the result of the planets’ magnetic fields interacting with the magnetic field of the sun. There are two planets in our solar system, Venus and Mars, that have no global magnetic field. Scientists theorize these planets lack magnetic fields because their cores lack dynamos of rotating convecting liquid metal such as iron. But there is no clear evidence of dynamos in the cores of any of the planets in our solar system nor any clear explanation as to how Venus or Mars could be missing theirs. 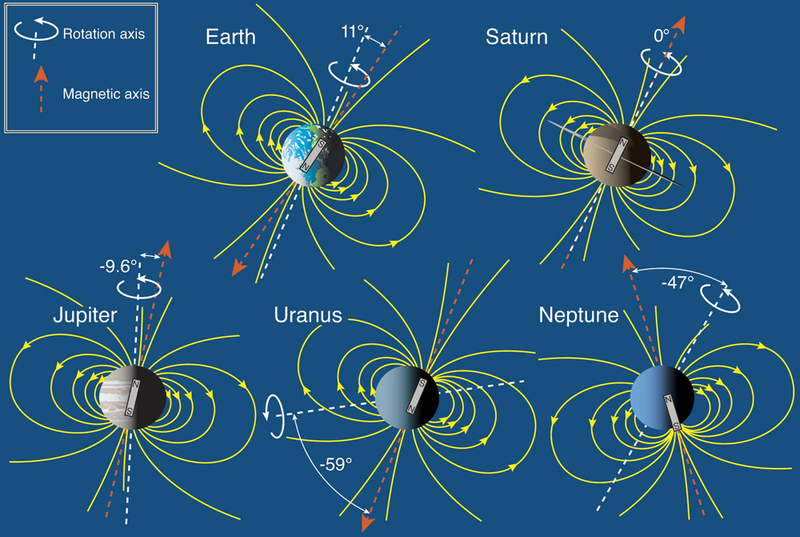 But what if the magnetic fields of the planets are actually powered by the magnetic field of the Sun? What would happen if the axis of the magnetic field of a planet began to tilt causing it to become more parallel with the orbital plane of the solar system? Would it eventually flip so that its poles are reversed as is the case with Earth’s and Uranus’ magnetic field? Or perhaps a tremendous electrical discharge would occur turning the planet into a plasma trailing volcanic inferno like Venus, or a dead world stripped of its oceans and atmosphere like Mars. Magnetic field alignments aren’t limited to just the planets in our solar system. In 2013 scientists from the University of Manchester reported that many of the bipolar planetary nebulae located in the central bulge of our galaxy have their long axes aligned along the plane of the galaxy. This behavior was described as “bizarre” by the scientists since planetary nebulae are thought to be shaped by the rotation of the star system from which they are formed. Nonetheless, the scientists did suggest that the alignments of the nebulae could have been caused by the presence of strong magnetic fields in the central bulge of the Milky Way. 5 comments on "Magnetic Field Alignments"
Interesting! Can you share some examples? Dont forget about those QSO surveys they did. They mapped several Quasars and found them to contain very similar magnetic alignments. And the scale is hundreds of millions of lightyears. Very scattered but a collective alignment. That sounds familiar, can you post a link(s)?